Every year, we love to celebrate the holiday season with our listeners, and there is no better way to do that then with our 5th Annual Holiday Special! It all started with a random idea, as Aaron and Scott were big fans of holiday specials, yet podcasts seemed to skip over the idea completely. 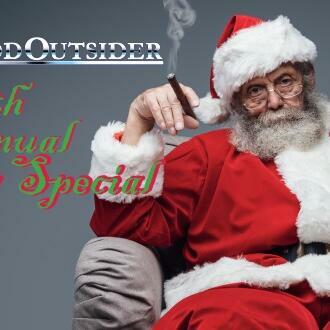 Therefore, we decided we can do whatever we want here at The Hollywood Outsider, so let’s create our own tradition and the Annual Holiday Special was born! Every year we do a little something different, so this year we are discussing Christmas movie clichés. Not in a negative way though, we are talking about clichés we love to see in our favorite holiday films. That’s not all, oh no. We also throw out recent additions to our holiday movie rotations and debate how difficult it is to make a holiday special or movie in today's climate. The Christmas spirit kicks into overdrive as we open up and share our personal memories of the holiday season, stories that remind us of Christmas. And no holiday special would be complete without a visit from the big man himself, so get ready as Santa Claus drops by the studio to read a few HO listener letters! With a special game from Amanda, a little whimsy from Aaron, Scott’s annual Christmas Poem, and a lot of fun for everyone – This is the one podcast you don’t want to miss this holiday season!